Caption: An illustration of the strong valley exciton interactions and transport in a 2-D semiconductor heterostructure. 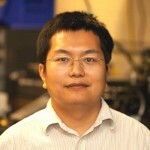 A team from UW physics professor Xiaodong Xu’s lab have created ultrathin semiconductor heterostructures for new technological applications, including photovoltaics and other electronics such as miniature and foldable devices. Xu and team have successfully demonstrated how to combine two different ultrathin semiconductors — each just one layer of atoms thick and roughly 100,000 times thinner than a human hair — to make a new two-dimensional heterostructure with potential uses in clean energy and optically-active electronics. The findings were in a paper published Feb. 12 in the journal Science. The Clean Energy Institute contributed funding for the project and supported the work of two Clean Energy Institute graduate fellows, Kyle Seyler and Pasqual Rivera, who are lead authors on the paper.